Today is the 100th anniversary of Franz Reichelt’s attempt to fly in Paris on the 4th February 1912. His choice of venue to demonstrate his solo flying contraption? The Eiffel Tower. The results? Not good. Notes and information regarding the Franz Reichelt Death Jump. The video was never actually issued by British Pathé, perhaps due to its shocking nature as the video shows the exact second that Franz Reichelt dies as he plummets terrifyingly to his death, and the aftermath scene is rather shocking too as Parisien press members rush forward to measure the depth of the hole left by Franz Reichelt’s body. However today this video is one of the most viewed British Pathé videos. A plethora of low-quality stolen versions appear on YouTube, but British Pathé are proud to have the best quality version of the reel on display. Footage discovered of The Red Woman of Paris – the scandalous Madame Steinheil. Every now and again a seemingly innocuous clip is brought to our attention when someone discovers there is more to it than meets the eye. 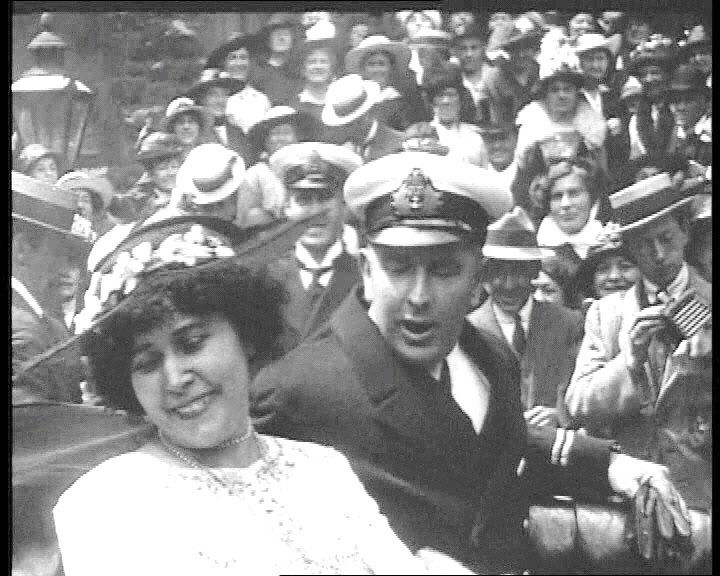 A friend of Pathé, Commander Tony Bullock, who has been kindly researching naval footage within our archive, came across a fairly bland 30 second clip of a 1917 naval wedding. There is not much information attached to the footage apart from one name – Madame Steinheil. Boring? Yes perhaps but not until Commander Bullock looked into who this Madame Steinheil was, did he realise that this footage is of a notorious French woman with a scandalous reputation and sensational complex history who was dubbed the Red Woman of Paris. She was most famous for her association with the death of the French President Félix Faure and later she was implicated in the murders of her own husband and stepmother. She was quite possibly the most talked about woman in France at the turn of the 20th century. Marguerite Steinheil, (née Japy ) later known as Lady Abinger and Mme de Serignac was born in to a wealthy family and after her marriage to a successful painter, Adolphe Steinheil, she immersed herself in Parisian high society and became extremely well connected to influential men within political and social circles, even counting the King of Cambodia as an admirer. 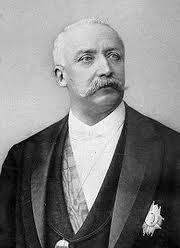 Marguerite first met the French President in 1897 when her husband was awarded a contract. Her husband’s frequent meetings with the President meant Marguerite became well acquainted with Faure and soon she became his mistress, often paying him visits in the private residence of the Palais de l’Élysée. On 16 February 1899, Marguerite made one of her illicit calls to the palace. Many rumours and much speculation surrounded the events but it was widely reported that when servants were called to the boudoir, Steinheil was adjusting her clothing, her hair was tousled and the President lay dead from a seizure – allegedly brought on by a passionate session. Mme Steinheil was quickly ushered out the back door. The embarrassment and shame that surely ensued after her connection with the death of the President did not, however, deter her having affairs with other men; in fact, she became the mistress of many more prominent men. Later doctors would go on to describe her as, “a highly neurotic subject with a pronounced tendency to hysteria, she seems to have exercised a curious spell upon all the men with whom she came in contact”. Her je ne sais quoi and femme fatale charms might explain why there were reports that men including the President even entrusted her with secret documents and manuscripts. Scandal was not to stop there. 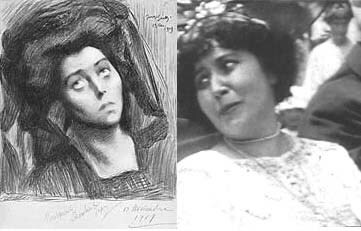 On May 31 1908, Marguerite’s husband and stepmother were found dead having been gagged, bound and strangled with a cord. Marguerite was also found gagged and bound to the bed but notably unharmed. Although she told police that there had been four intruders dressed in long black robes, she was a suspect from the start. The police initially did not have the evidence to prosecute but her stories began to unravel when she went on to deliberately frame her valet de chambre by planting a piece of evidence in his room. When her plot was unveiled she subsequently accused her housekeeper’s son of committing the murders. She was arrested later in the year and charged on complicity in the double murder. The events surrounding the murder and the trial caused a feeding frenzy in Paris and there was a gender divided opinion. 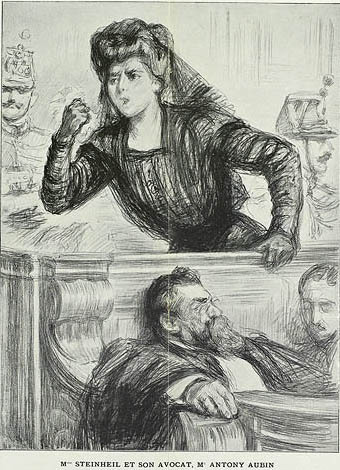 And although the court had called her stories a “tissue of lies”, the rather theatrical trial climaxed with Mme Steinheil’s unexpected acquittal. 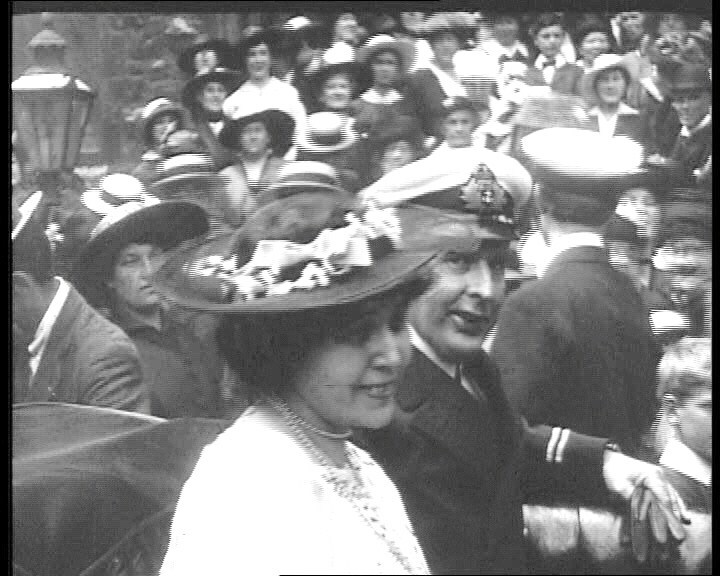 After her narrow escape from the guillotine, Steinheil moved to England and in 1917 she married the 6th Baron Abinger, Robert Brooke Campbell Scarlett who served in the Royal Navy. And so here you have it, British Pathé captured this newly married couple leaving the church on their wedding day. At first it seemed a fairly unexciting clip except now we know that this is footage of a woman embroiled in two of the biggest scandals of her time. Author British PathéPosted on 23 December 2010 23 December 2010 Categories Arts/Entertainment, History, PoliticsTags affairs, baron abinger, death, Felix Faure, footage, French president, high society, Madame Steinheil, marguerite, Marguerite Steinheil, murder, Paris, scandal, secrets, steinheil3 Comments on Footage discovered of The Red Woman of Paris – the scandalous Madame Steinheil. If you search ‘FRANCE’ as a keyword in the British Pathé archive 5688 films show up. See for yourself here – old film footage of France.